If you’re looking for a wood that will turn your floor into the focal point of the room, tigerwood is it. Also known as African walnut, goncalo alves, and Brazilian koa, tigerwood is endowed with bold splashes of color that set it apart from plainer hardwoods. The durability and water-resistance of this wood add to its value as a flooring material. Due to environmental concerns and installation difficulties, though, you’ll need to do some planning if you want this wood in your home. Tigerwood takes its name from its vibrant tiger-like stripes, which range from light orange and golden tan to a deep russet brown, varying in thickness from broad strokes to delicate lines. There are few knots to interfere with the flow of colors. No other wood used for flooring looks quite like it. Whereas the relatively plain coloration of oak, maple, and birch quietly recedes to create an unobtrusive backdrop for your furniture and decor, tigerwood turns your floor into a focal point in and of itself. It’s ideal if you prefer simple furniture, but still want to give the room some personality. Unlike most woods, tigerwood is graded primarily based on its coloring. It’s most often available in clear grade and common grade. Clear grade offers brown and black stripes against an overall deep rosy-orange base. Common grade has less pronounced color variation and might include minor defects such as planer grooves or ripples. With a 1850 Janka scale rating, tigerwood is harder than most flooring hardwoods, including maple and pecan hickory. Its tough surface resists dents and dings, so it stays looking new longer. It’s a great choice for families with young children or large dogs. On the other hand, it’s somewhat softer and more resilient than ipe or cumaru wood, making it more comfortable underfoot. Tigerwood’s high density and abundance of natural oils give it a strong advantage in water-resistance. 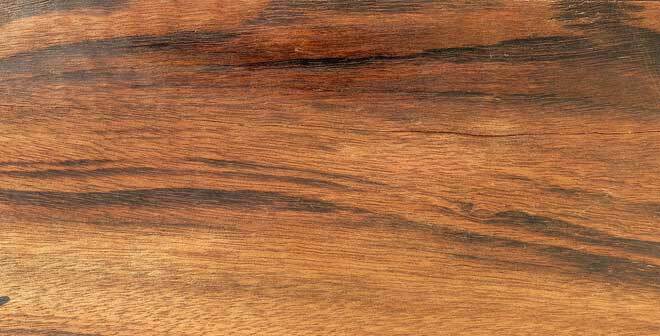 Once a finish is applied, tigerwood is unlikely to warp, crack or rot even in a relatively damp environment. Like famously weather-resistant teakwood, it’s often used for decking and outdoor furniture. While wood flooring generally isn’t recommended for bathrooms, if you have your heart set on a hardwood bathroom floor, tigerwood is one of the best choices. As an exotic hardwood, tigerwood isn’t the cheapest thing you could put on your floor, but it is less expensive than ipe, teak, and ebony. Typically, you’ll find the price comparable to mahogany and cumaru. It’s an economical option if you’re looking for a highly durable, moisture-resistant wood with distinct coloring. To keep your tigerwood floor clean, it’s enough to damp mop it once a week with a solution of 1/4 cup white vinegar in a quart of water. A solution of 1/4 cup liquid Castile soap and 2 gallons of water also works well. These mild cleaners break down grime without harming the floor’s finish or causing discoloration. If you need to clean up the floor more often, use a dust mop. Avoid harsh cleaners not designed for exotic hardwoods and never leave standing water on the floor. The rich color variations tigerwood is so loved for don’t always stay as prominent as they are when the floor is new. The lighter colors of the sapwood tend to deepen over time into a reddish or dark brown, so they contrast less with the darker heartwood. It’s a problem common to many richly hued hardwoods, but it can take the drama out of a tigerwood floor. That said, noticeable color changes usually take at least 10 years, and you can slow the process by using UV-filtering window shades or film to limit the amount of sunlight that hits the floor. While the tigerwood tree itself isn’t an endangered species, the rainforests where it grows are often endangered by over-logging. Thanks to the growing interest in this wood, many of the African and South American countries where it grows have established export restrictions to prevent over-harvesting and resulting environmental damage. Brazil, where much of the tigerwood in the US comes from, has particularly tight controls. On the plus side, tigerwood is a fast-growing species, making it a more sustainable alternative to the slower growing ipe wood. If you decide you want tigerwood in your home, choose wood that carries Forest Stewardship Council (FSC) certification, which ensures the wood was sustainably harvested. Tigerwood’s hardness makes it difficult to install without professional grade tools. Cutting it requires carbon-tipped saw blades. To use screws or nails, you’ll need to pre-drill holes, which requires a drill with a carbide bit. Gluing the wood is possible, but not easy thanks to the natural oils that inhibit the glue from setting. Sanding is a challenge because tigerwood dust can irritate your skin and eyes. Just as it resists water penetration, tigerwood also resists stains and preservatives. Only very low viscosity products will do the job. For a floor that steals the show, it’s hard to do better than tigerwood. The wood’s bold, variegated coloring will add warmth to a living room or bedroom and a little extra flair to a game room or home bar. Its hardness means you won’t have to worry about it getting scratched up by your kids and pets. It’s a challenge for a DIY-er to work with, though, so budget for professional installation when planning your new floor.